It wasn’t pretty, but when you go on the road, a win is a win, and Sunday the Packers did just enough to stay undefeated. In a game that looked more like a AFL shootout, the Packers topped the San Diego Chargers 45-38 to move to 8-0 on the season. Aaron Rodgers outdueled Philip Rivers, going 21-of-26 for 247 yards and four touchdowns, while Rivers also threw for four scores and 385 yards on 26-of-46 efficiency but was intercepted three times. Jordy Nelson racked up 105 yards and a score on five receptions for the Packers (8-0), who have won a season’s first eight games for the first time since going 10-0 to start off the 1962 campaign. Greg Jennings and Jermichael Finley also hauled in a TD pass as Green Bay extended its winning streak to 14 games. Charlie Peprah notched a pair of picks — including a 40-yard return for a touchdown — and Tramon Williams contributed a 43-yard interception return of his own. Vincent Jackson totaled 141 yards and three TD receptions on seven grabs for the Chargers (4-4), who have dropped three straight. Antonio Gates added 96 yards and a score on eight catches, while Mike Tolbert racked up 83 yards and a touchdown on 19 carries. Jennings’ four-yard scoring grab upped the Packers’ edge to 45-24 with 10:27 remaining in regulation, but San Diego roared back to make it a tight game. Jackson registered back-to-back TD receptions — one of five yards and one of 29 following an onside kick recovery — and the home team found themselves down 45-38 with 6:25 remaining. 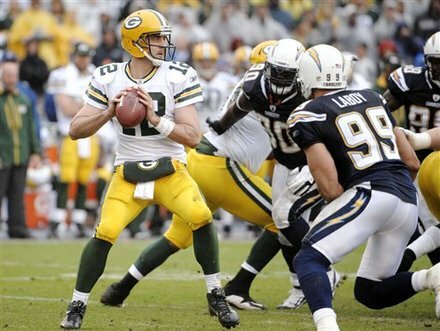 Green Bay followed with a three-and-out, but San Diego couldn’t move past its own 42. A punt pinned the Packers at their own four, and the Chargers defense held James Starks to no gain on 3rd-and-2 from the visitors’ 25. San Diego then had possession on its own 31 with 1:05 to play — but no timeouts. Rivers found Gates for 19 yards on 2nd-and-10, and the home team was given new life when Charles Woodson was flagged for pass interference on third down. Set up at the Packers’ 41, an incompletion preceded Peprah hauling in an errant offering and rolling 76 yards from his own 18 to the Bolts’ six to lock up the win. Under overcast skies, Rivers hit Jackson in the end zone for a 23-yard score and early 7-0 edge to cap the game’s first series. 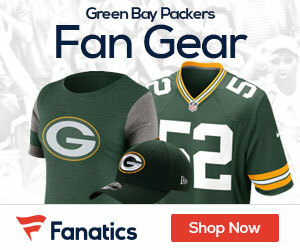 Green Bay countered on its first touch as Rodgers fired off a five-yard TD pass to Finley. Green Bay’s defense then provided a comfortable margin for its offense. Three plays after the tying score, Peprah picked off Rivers, and he dodged several tackles on the way to a 40-yard touchdown. On the Bolts’ next series, Rivers threw right into the hands of Williams, and he rumbled untouched 43 yards down the left sideline to make it 21-7. Tolbert’s eight-yard run got the Chargers within a score early in the second and a Nick Novak 52-yarder made it a four-point spread, but the Pack went to halftime up 28-17 after a 16-yard TD catch by Nelson. Mason Crosby connected from 47 yards out early in the third, then Gates managed to reach the left pylon on an 11-yard reception which made it 31-24 later in the quarter. Green Bay continued to push as the rain picked up in intensity, and assumed a 14-point edge once more after Rodgers hit James Jones for a 21-yard score two minutes into the final quarter.